CodePix now enables open access to unlock posts via the web without installing the app or creating an account. The new version also comes along with compelling new features such as web embed and GIF support. Now anyone can unlock CodePix posts...even those that don't have the app installed. CodePix, an interactive content sharing app, launched a web version of its popular app this week. CodePix is a unique app that allows users to post private images and messages that can only be revealed by drawing a gesture passcode. Anyone can attempt to crack the code to reveal the hidden content, but only those who know the passcode can unlock and view the post. Open Web Unlock - Now anyone can unlock CodePix posts with the correct password, even those that don’t have the app installed or an account. Embed - Embed CodePix posts right into a webpage, blog, newsletter or other third-party content. Click here to see an example. GIF support - Last but definitely not least, CodePix now supports animated GIF’s so users can take their posts to a whole new level. 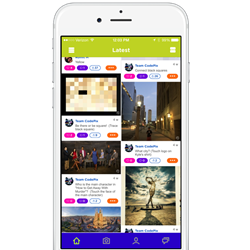 CodePix is the next evolution of social sharing. It utilizes touch gestures and gamification to increase social interactions amongst users. This multi-channel platform allows users to create interesting and challenging posts for their audience to uncover hidden content, making for an exciting experience and overall fresh new way to communicate. For commercial content creators, the interactive nature of CodePix leads to higher levels of audience engagement and ultimately into greater potential for revenue generation. About CodePix, Inc. - CodePix, Inc. is a privately-held company headquartered in Texas. CodePix is predicated on patent-pending technology for image-based locks in front of social content. CodePix was co-founded by Manish Chhadua. Chhadua graduated from the University of Texas at Austin with a Bachelors in Computer Science. Previously, he was a product manager at a Fortune 20 company launching leading edge technologies.